Dietary fibre protects colon cancer by binding to potentially harmful bile acids and decreasing the transit time of the bulk of matter moving through the intestine, thus reducing the amount of time the colon comes in contact with dietary carcinogens including the N-nitroso compounds produced by meat consumption. Meat eaters are therefore particularly advised to increase their dietary fibre intake as are individuals concerned about their blood fat levels. Regular fibre has been shown to reduce saturated fats and cholesterol levels. The evidence Historically fibre has not always been thought to protect against cancer. A serious blow to dietary fibre protagonists occurred in the year 2000 when three separate clinical trials showed no significant association between fibre intake and the risk of developing polyps following cancer or polyp resection. These trials where most likely to have been negative because of the crucial issue of what they defined as a high and low fibre diet. In the negative USA study the difference in the quantity fibre, between high and low intake, was fairly narrow and the trial also didn’t take into account other factors such as meat intake. On the contrary the positive UK EPIC study, mentioned above, had a large difference in fibre intake between to the two comparative groups and also incorporated meat intake into the analysis. Furthermore, in the epic trial patients who had a high fibre intake also had a lower red meat intake which was unlikely to be the case in the USA where red meat intake is generally higher. It is this balance of fibre and meat which therefore seems most important rather than one or the other individually. 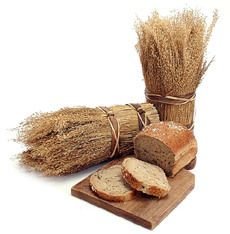 In most European countries, the consumption of dietary fibre has been estimated to be around 20g per day. An increased daily intake, to approximately 30g, is encouraged to promote health benefits associated with fibre. Seeds; dried pumpkin, sunflower and linseeds. Recipe tip: Try putting a tablespoon of linseeds in a cup of water before bedtime - in the morning they will be nice and soft - spread on your breakfast cereals or mix with some yogurt and raisins - lovely!